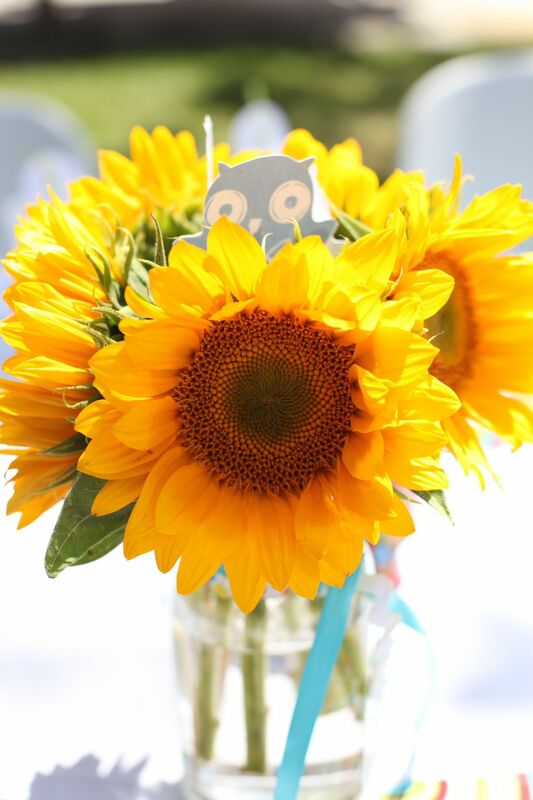 In the months leading up to my son’s first birthday, I was kind of stumped on theme ideas. I wanted a party that reflected him, but it’s hard to plan a birthday party based on what a 10 month old is into. He was really into milk and trying to get his body to go where he wanted it to. Kinda hard to make those themes “party” if you know what I mean. 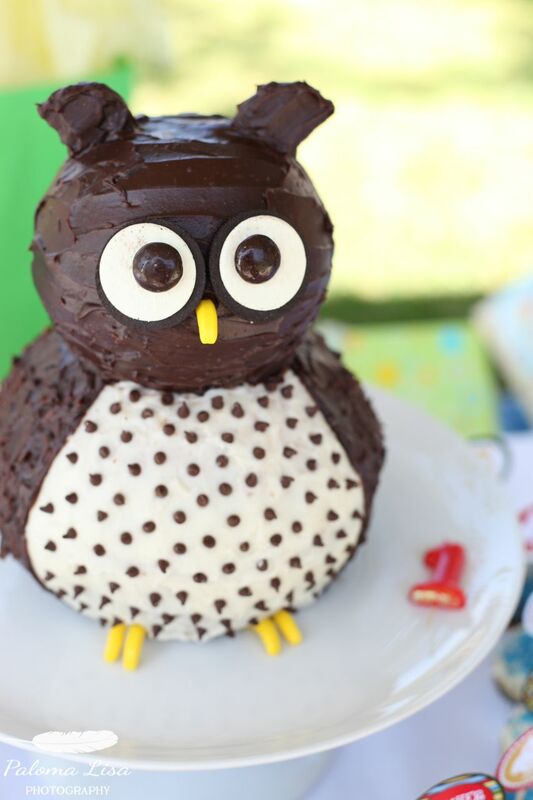 So, our son’s 1st birthday party was inspired by his love of making a whoo whoo sound. He made it a lot and was delighted with himself when he did. 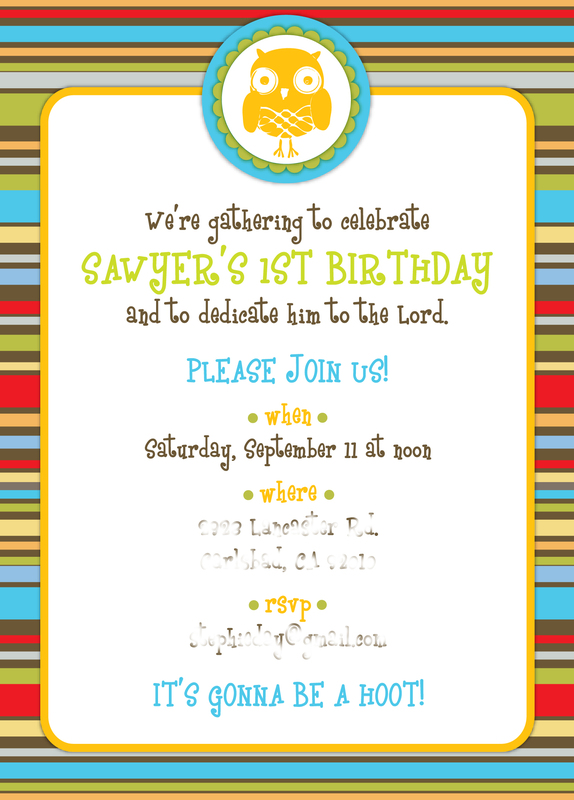 For invitations and decorations, I ordered these custom digital designs from chachkedesigns on Etsy.com. Just print yourself, cut and assemble. 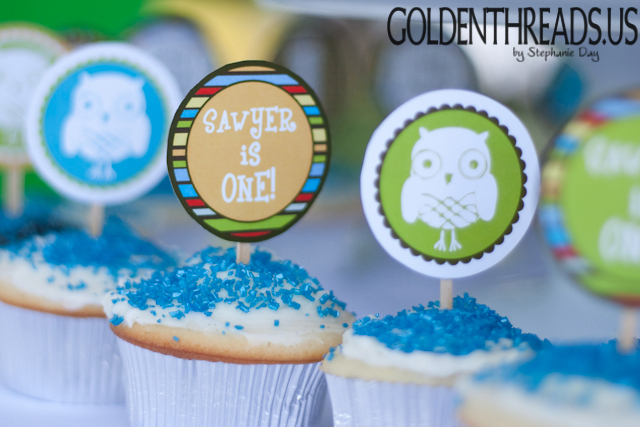 We used the garlands, party hats, favor tags, thank you cards and cupcake toppers. I always imagined that when I had kids, I would make them really special birthday cakes because that’s what my mom did. This was my first child’s first birthday and therefore my first attempt at cake greatness. I followed these directions from an article in Parenting Magazine and it turned out fabulously! Lucky for us, one of our guests is a incredible photographer at Paloma Lisa Photography and she happened to bring her camera. The birthday boy’s shirt was too hard to pass up. Who doesn’t need a shirt with an owl wearing a Fedora? I ordered it on Etsy.com in a shop called Crowsmack. We held the party in the little park next to our house and set up the grill, tables, chairs and toys for the kids to play with. We served grilled chicken burgers with BBQ sauce, Monterey Jack cheese, red onion and cilantro. On the side was a caesar pasta salad, assorted fruit, owl shaped PB & J’s and lemonade. 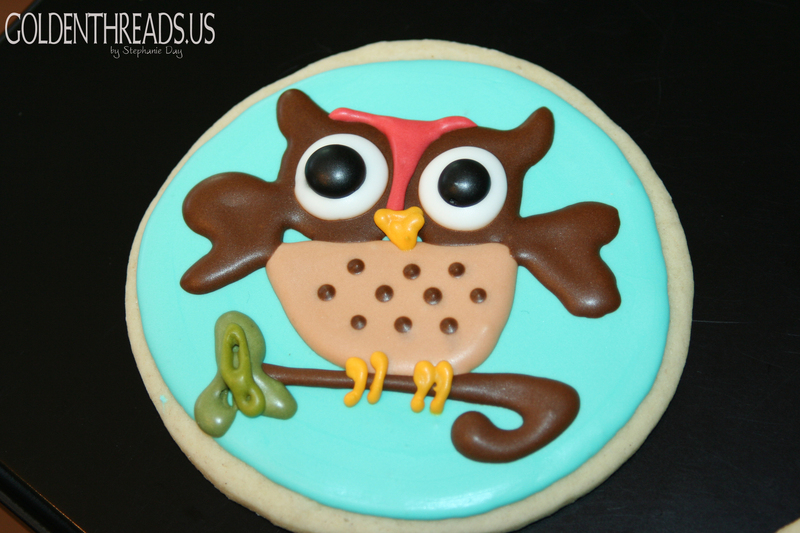 I had always wanted to try making iced sugar cookies like the adorably detailed kind you find in bakeries. I was a little intimidated so I asked my sister who is a great baker to help me. I found some owls that I liked the look of and went for it. We got most of our helpful tips from a blog called Sweetopia and especially appreciated the hints for using royal icing. 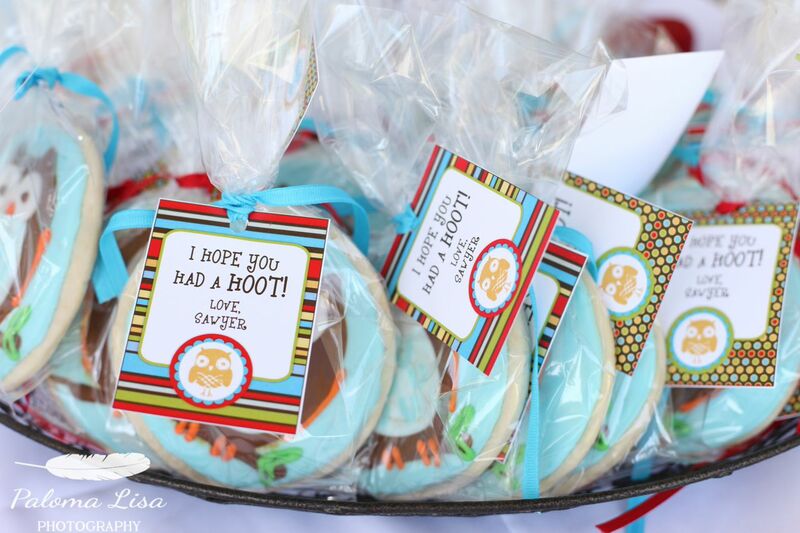 Shortly after this party, I was hired to make similar cookies for another child’s birthday party. I was given a specific owl for inspiration, made about 40 of them, packaged them very carefully and sent them via FedEx to LA. 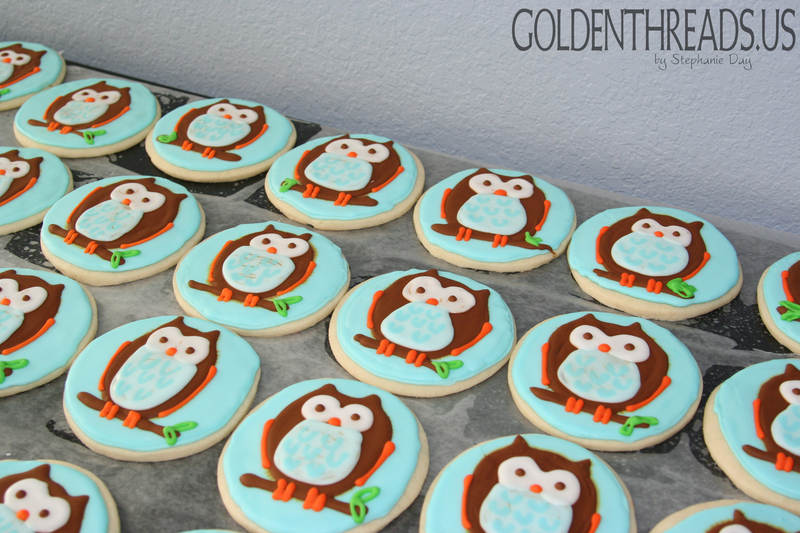 Although these cookies were incredibly time consuming, I had a lot of fun. Here is the finished product. 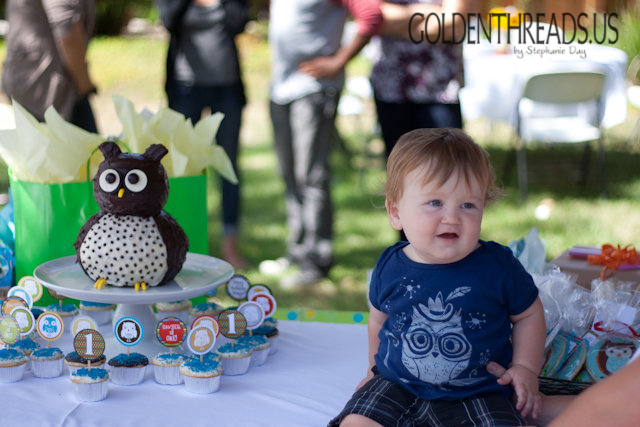 Our owl party started a tradition of combining our kids’ baby dedication with their first birthday celebration. Baby dedications are a common tradition in the Evangelical church and are most often done during a service before the congregation. We support that as a great practice, but have enjoyed the intimacy of this experience done in our yard surrounded by our closest friends and family. Much like in a church, our little ceremony consisted of gathering before God and our faith community to ask for wisdom and grace in raising the little one that God has entrusted to us. We committed as parents to love God ourselves and to teach our son the ways of The Lord. Each person that came wrote out a little prayer and as we read them aloud, we were so encouraged by the investment each guest has in the life of our family. We have those note cards bound together for our son to keep as he grows up. Our son’s first birthday was really meaningful and even though he won’t remember it, he can look back on pictures and read through our prayers for him, knowing that he is treasured. We had a great day. 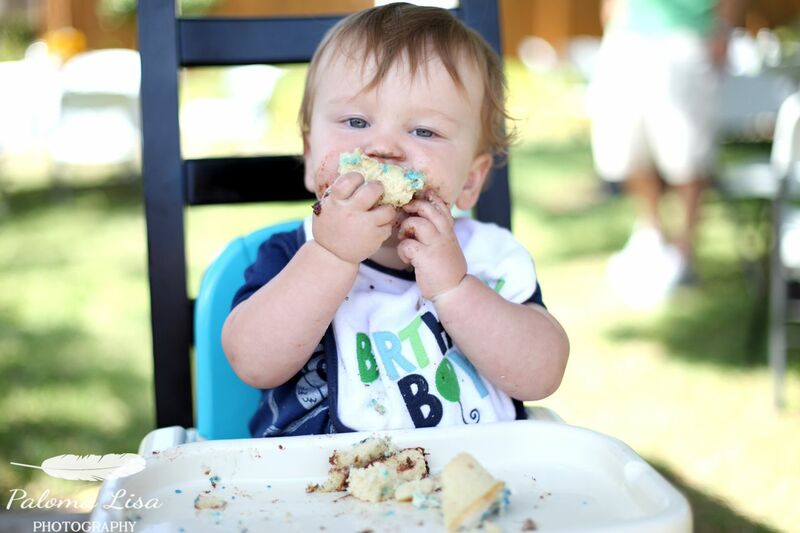 Our little buddy was chubby and smiley and happy to dig into his cake. 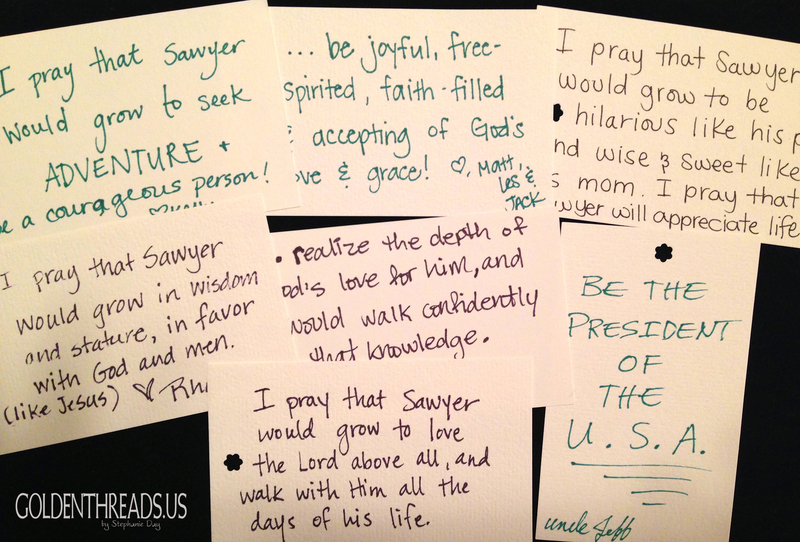 Our family & friends wrote out prayers for our son at his first birthday party and these are a few of them. We will always treasure these. LOVED this party. Loved the cookies, loved the shirt, loved the decor. And most of all loved, and still love, sweet Sawyer. What a cutie patootie chunk!!!! I can’t even believe how old he is now!!! !